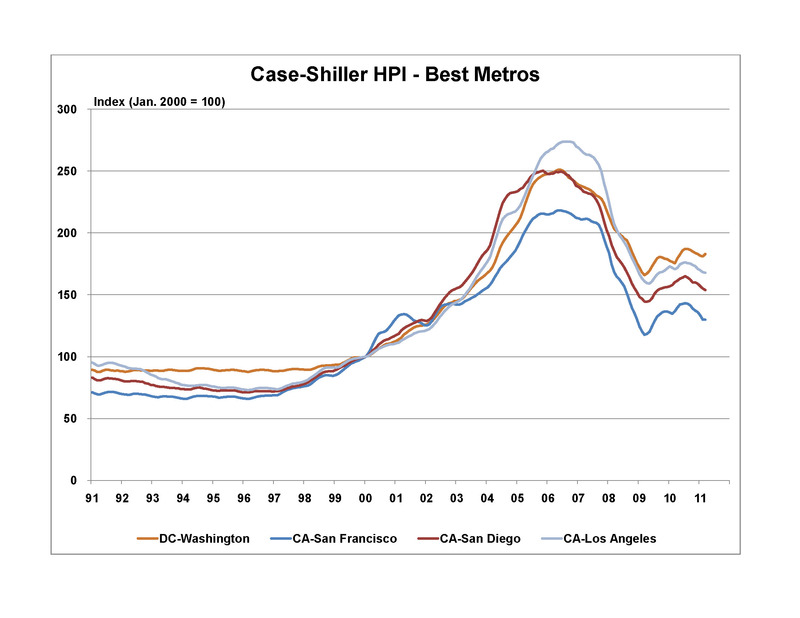 The Standard & Poor’s Case-Shiller house price index (HPI) fell to a new low in March with the quarterly National index, as well as the monthly Composite 20 (CS20) and Composite 10 (CS10) indexes sinking below their previous cyclical lows of early 2009. The National index was down 4.1% on a not seasonally adjusted (NSA) basis in the first quarter of 2011 and the monthly Composite 20 (CS20) and Composite 10 (CS10) indexes fell 0.8% and 0.6% (NSA) respectively in March. This was the third consecutive decline of the quarterly index and the eighth consecutive decline for the monthly indexes. Year-over-year, National index is down 5.1% and the CS10 and CS20 are down 2.9% and 3.6%, respectively. Prices declined in 18 of the 20 cities covered by the index on a not seasonally adjusted basis (but were up in 7 cities on a seasonally adjusted basis). On a not seasonally adjusted basis, the largest declines were observed in Minneapolis (-3.7%), Charlotte (-2.4%), Chicago (-2.4%), Detroit (-2.0%) and Atlanta (-1.9%). Washington DC (+1.1% NSA) and Seattle (+0.1) were the only cities to experience an increase. With the recent declines, twelve of the 20 cities in the CS20 index—Atlanta, Charlotte, Chicago, Cleveland, Detroit, Las Vegas, Miami, Minneapolis, New York, Phoenix, Portland OR, Seattle and Tampa—have fallen to their lowest level of the current housing cycle. 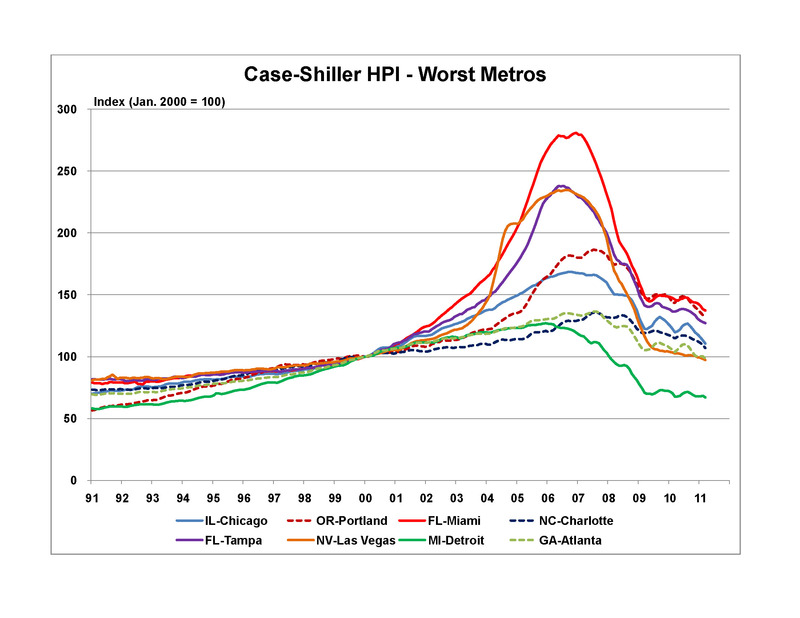 However, the pattern is not uniform across the metropolitan areas. Washington DC (10.3% above its 2009 low), San Francisco (10.3%), San Diego (6.5%) and Los Angeles (5.4%) have experienced solid house price appreciation, while Boston (1.0%), Dallas (0.6%), Denver (0.3%) also remain above their 2009 low. Other key housing market indicators have also trended down in recent months, with housing starts falling 11% and existing home sales down 1% in April. New home sales moved against the trend in April, with a moderate 7% increase, but remain close to historic lows. This suggests that house prices are likely to remain weak in the in the second quarter of 2011. 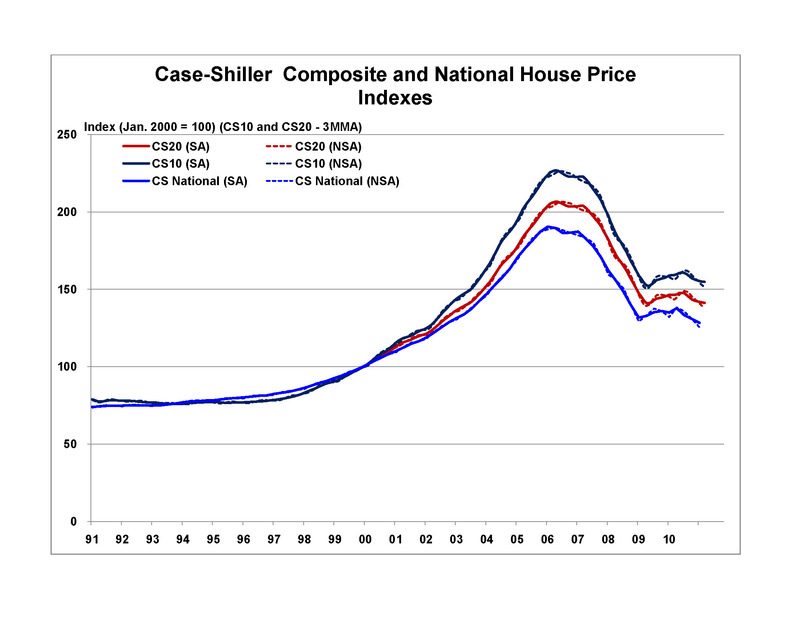 Since reaching the trough in early 2009, despite the rise and fall associated with the various phases of the home buyer tax credit, the broad trend in the Case-Shiller composite indexes has been flat. Further fluctuation in the house prices measures are anticipated in the coming months. However, overall we expect house prices to remain relatively flat through 2011, then to show modest growth in 2012.